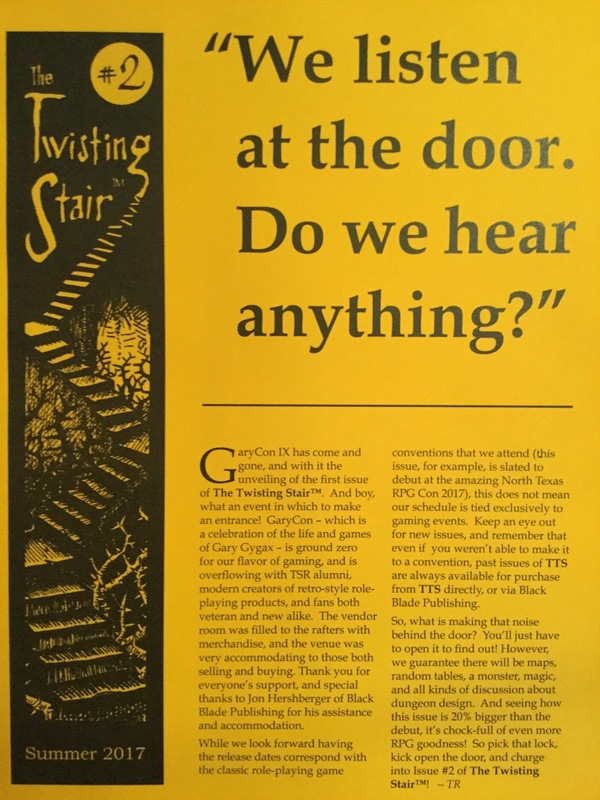 Published by The Twisting Stair Partnership, but available via Black Blade Publishing, The Twisting Stair is different. Not only in terms of its format—it comes in A4 size rather than the digest size which is standard for most fanzines then and now—but also in terms of the retroclone it is written for. The Twisting Stair is written for use with OSRIC, the Old School Reference and Index Compilation roleplaying game which emulates the first edition of Advanced Dungeons & Dragons. This is of course, the version of choice for retroclones which emulate Advanced Dungeons & Dragons, though the majority of retroclones do derive from Basic Dungeons & Dragons or just Dungeons & Dragons. Published in the Summer of 2017, The Twisting Stair #2 follows the pattern set by The Twisting Stair #1, but increases the number of articles it contains from four to five, plus of course, the Dungeon Geomorphs. All of the articles are penned by Allan T. Grohe Jr. and Tony Rosten, either together or separately, and both have their own columns. Grohe has ‘From Kuroth‘s Quill’ and Rosten has ‘Down the Twisting Stair – An ongoing exercise in megadungeon design’, which much like the first issue, bookend this issue. Between them is the simple ‘Critters & Glitters’, a combined monsters and magic items column, ‘The Centerfold Mega-Dungeon Map’, and ‘Wandering Pairings’. All this comes in a second issue with an increased page count, from sixteen to twenty. Once past the editorial—a short rumination upon the appearance of The Twisting Stair #1 at GaryCon IX—The Twisting Star #2 opens with ‘From Kuroth‘s Quill’. This is Allan T. Grohe Jr.’s design column and this time it concludes ‘Combined Hoards as Adventure Hooks: Treasure Maps in the Mega-Dungeon (Part 1 of 2)’, which was published in the previous, first issue. In ‘Treasure Maps: From Traditional to Enigmatic’ it continues the examination of the nature and form of the treasure map. It is quite a short piece, providing a few suggestions as to on what a treasure map might appear, perhaps on a sword hilt, across multiple items or places, appearing only in the light of the waning moon, and so on. It supports these ideas with a set of tables to expand the standard set given in the Dungeon Master’s Guide for Advanced Dungeons & Dragons and continue those begun in The Twisting Stair #1. Together, this has been a decent series, although it could have benefited from an example or two, perhaps towards supporting the mega-dungeon that the fanzine builds itself around—at least in map form. Both Grohe and Rosten contribute ‘Maps and Symbols: the Keys to the Mega-Dungeon’, a solid set of map symbols to use when designing dungeons. The set includes new symbols for magical gates, walls, and areas of effect as well as teleporters and redesigns some old classics for clarity and purpose. This is followed ‘Critters & Glitters’, which details exactly one spell and one monster. The former is the Naamah, a Greater Devil which works as a free agent to seduce, enslave, and corrupt the souls of mortals. It has the appearance of a beautiful woman bar her almost skeletal lower legs and taloned feet, crimson skin, and black and ice blue eyes. Although the Naamah can use them to deliver vicious attacks , she prefers to charm and bind her victims her, which has the awful side effect of adjusting their Alignment to Lawful Evil. The accompanying illustration is excellent and overall, the creature has a baroque, old fashioned feel that would work well enough in any Old School Renaissance, but also in Empire of the Petal Throne too. The spell is The Multi-Faceted Portal-Penetrating Gaze, a Fourth Level Magic-User spell. It allows the caster to examine portals—gates, teleporters, colour pools, and so on—and peer view through to the other side. Depending upon the variation cast, the Magic-User can discern the destination, peer beyond the veil to scrye the area around the portal’s destination, and regard the portal to learn about its true nature. This is a good spell and it really would be a useful spell for anyone running a campaign based around gates and portals. It is also the perfect accompaniment to Lost Pages’ Kefitzah Haderech: Incunabulum of the Uncanny Gates and Portals. At the centre of the issue is Level Two of The Twisting Stair’s ongoing mega-dungeon maps. Like the first, it has several blank spots where dungeon geomorphs—smaller maps that can be inserted and rotated to suit—can be placed. Now unfortunately, what The Twisting Stair #2 lacks is detailed geomorphs, which is a shame because they were the highlight of the first issue. What the second issue does include is ‘Wandering Pairings’, a random encounter table for Level Two. It lists new monsters to be encountered on this level as well as monsters from Level One that have spread down and adapted to Level Two. The notable feature of Level Two is the large waterway running through it and the table reflects this. Tony Rosten’s column is ‘Down the Twisting Stair’, which it describes as ‘An ongoing exercise in in mega-dungeon design’. In The Twisting Star #1, the column presented three geomorphs, each a well designed encounter ready to be dropped into Level One of the mega-dungeon. This time, the column looks at ‘Mega-dungeon Accoutrements’. What the author is talking here is a dungeon’s regular features which make it distinctive and memorable. They can be environmental, mechanical, or speciality accoutrements, and certainly in examining the first, the author nicely references back to E. Gary Gygax’s own designs. An environmental accoutrement is a descriptive feature that has a broader effect upon a dungeon exploration; a mechanical accoutrement is one which consistently embellishes a common trapping found throughout most dungeons; and a speciality accoutrement combines elements of the two to present something more like a traditional encounter. Besides describing them, the author also presents an accoutrement quartet. ‘Locks and Keys’ are a mechanical accoutrement which detail how both appear and function in the author’s home dungeon; ‘The Lanterns of Celestial Lights’ are a speciality accoutrement, lanterns installed around a dungeon whose lens can be changed for various effects, such as showing events in the past or detecting evil; ‘Blighted Brambles’ is another speciality accoutrement, thorny bushes and thickets which are typically hard to hack through and which come in multiple colours and types; and ‘The Chronoporter’ is a third speciality accoutrement, a teleporting room which gives access to multiple Levels of the dungeon and locations there on, but only at set times and even on set dates. These are interesting and useful supporting examples which nicely showcase the ideas discussed in the article. Physically, The Twisting Stair #2 is well presented, if very lightly illustrated. It does feel thin though, even with the increase in page. Part of that is down to the format—A4 rather than the A5 which is usual for most fanzines. It also feels somewhat light in terms of content. This is not to say that the content is neither interesting or useful, for as with the first issue, both ‘From Kuroth‘s Quill’ and ‘Down the Twisting Stair’ are excellent pieces, if perhaps tending towards the theory. Unlike The Twisting Stair #1, there are no stand out pieces which a Dungeon Master can just drop into a campaign in The Twisting Stair #2, which is a shame because the sample geomorphs, fully written up as encounters, of the first issue were excellent. Nevertheless, The Twisting Stair #2 is a good read if you looking for advice and taking the time to design your own mega-dungeon.